T-Shirt, "My tree's lit all year round." T-Shirt, "I'm high all of the time"
T-Shirt, "MVB : Most Valuable Boyfriend"
T-Shirt, "It's all fun and games until someone throws a rod"
T-Shirt, "Big Block : Size does matter"
Refer to the size chart on the left for selecting the proper size shirt. If you are unsure, or you size falls in between 2 sizes, we suggest getting the larger size. 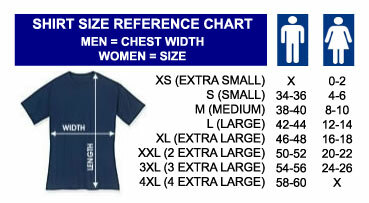 Unisex shirts (standard) are designed for men and women. Ladies shirts are designed specifically for women.